The History of Acklington, Northumberland. To be sold, the unexpired lease of the woollen manufactory at Acklington park and a small farm of 70 acres. The above has been established for thirty-five years, and the proprietor from advanced age and infirm health is desirous to retire from business. The manufactory consists of an oblong brick building of four floors, fulling mill, dye and drying houses, workshops, wool lofts, warehouses, residence for proprietor, workmen's cottages, and farm buildings. Apply to S. & T. Reed of Newcastle, solicitors. Newcastle papers, 10th April, 1828. Ibid. 18th March, 1797, and 10th June, 1797. Newcastle Courant, 2nd January, 1796. Tradition says Kendal took a dislike to the place through the drowning of one of his daughters in the water above the caul. `1785, September 20th, Susannah, daughter of George Kendal of Acklington park,' buried. Warkworth Register. This warehouse, which stood on the river side between Warkworth and Amble, was taken down about 1895, and the material used in the rebuilding of a cottage at the Beal-bank at Warkworth. Cf. Smeaton, Reports (1776), ii. p. 324, where there is a plan of the dam. 'To be let and entered immediately a farm of land at Acklington park consisting of 500 acres, with all necessary conveniences on the same, and pays only a small modus in lieu of all tithes. Also to be sold to the person taking it (if required) all the stock of cattle and implements of husbandry. Enquire of Mr. Edward Cook of Togston, Mr. Edward Cook of Brainshaugh, or Mr. William Hudson, brazier, at the Foot of the Side, Newcastle. Newcastle Journal, 14th February, 1747. All persons to whom William Hudson, brazier, deceased, stood indebted are requested to send their accounts to his widow and executrix, Mrs. Ann Hudson, who intends to carry on the business in all its branches. A spaniel dog to be sold. Ibid. 6th April, 1765. ` William Hudson of the Side, tin plate worker.' Whitehead, Newcastle Directory, 1778. Letter from James Morton to Mr. John Cook of Togston, copied from the original with Mr. J. Cookson by the Rev. John Hodgson. James Morton of Newcastle, merchant, on the 10th July, 1701, took a 21 years' lease of Acklington park. Rev. John Hodgson's Collection. Amble Guard Book. John Rushworth, in a letter to John Aubrey, the antiquary, says, `I was born in Northumberland; but my parents were both born in the county of York.' Aubrey, Brief Lives, ii. p. 207. Arch. Ael. 4to series, i. p. 167. Cal. Border Papers, Bain, p. 78. Mayson's Survey, circa 1616. Ibid. Endorsed in the same hand 'For Sr. Edward Fytton. A vewe of the parkes for yo to see and th'old renttes of theym.' Survey of 1585. Duke of Northumberland's MSS. Survey of 1585. Ibid. This payment was in addition to and different from the rent hens paid by every house. ' Every tenant of the townes of Thropton, Snytter, and Newtowne pay yearely to his lordshipp's use one rent henne . . . for their cattell goeing and feeding in the stubbles of his lordshipp's demeyne,' etc. Ibid. See above, p. 359. 1581, 20th June : Inventory of Cuthbert Horsley, late of Acklington park, gent. Summa, £19 5s. 3d. Raine, Test. Dunelm. Bailiffs' Accounts. Duke of Northumberland's MSS. Nicolson, Border Laws, p. 222. Arch. Ael. 4to series, iv. p. 162. 'A vew of all my lord's dere in Cumberland and Northumberland' in the 4 and 5 Henry VIII. Duke of Northumberland's MSS. 'A description and gross valuation of all the castles, rents and farms. etc., and numbers of able men to serve the king conveyed to King Henry VIII. by the earl of Northumberland.' Duke of Northumberland's MSS. Ibid. 22 Hen. VII. Ibid. Ibid. 3 Hen. VII. Ibid. Ibid. 2 Hen. VII. Ibid. Ibid. 20 Edw. IV. Ibid. Bailiffs' Accounts, 12 Edw. IV. Duke of Northumberland's MSS. Sturwys or stowres = stakes. The following list of the farmers and keepers of Acklington park is compiled from the Bailiffs' Accounts, etc. : 1486, Henry Ellergyll, vicar of Warkworth, farmer ; 1487, James Caterall, parker ; 1489, James Caterall, parker (he was living and pensioned in 1508) 1503-1506, Edw. Radcliffe, farmer ; 1508, James Benely, parker ; 1519, John Symson, agister ; 1523, Alan Horsley, agister ; 1524, John Symson, agister ; 1526, James Fawkner, agister ; 1532, Thos. Horsley, farmer ; 1537, Thomas Harbottle, farmer ; 1541, Robert Harbottle, farmer ; 1561 and 1562, Robert Horsley, farmer ; 1571, Margaret Harbottle, agister ; 1585, William Wycliff, farmer, and Geo. Horsley, keeper ; 1587-1592, Roger Thorp, farmer ; 1602, John Rushforth, gent, farmer. Duke of Northumberland's MSS. Cartington's Rental. Duke of Northumberland's MSS. 'Fall' = faid; the Northumbrian form of fold or enclosure for sheep, etc. This close may have belonged to the chapel of St. Mary Magdalen at Warkworth. 1438-39. Werkworth, 26s. 8d. de Com. Northumbr. pro ferma capelle B. Mar. Magd. et pro 120 acr. terr. arab, et pro prato quod vocatur Braynly infra parcum de Aklynton ut patet per cartam Joh. fil. Roberti ; summa, 26s. 8d. Durham Account Rolls, Fowler, i. p. 63. Surtees Soc. No. 99. Cf. p. 123 supra. Inq. p.m. Henry Percy, 42 Edw. III. No. 48. Ibid. p. 111. Inq. p.m. Henry Percy, 26 Edw. III. No. 52 a. Ibid. p. 108. Inq. p.m. Robt. fil. Roger, 3 Edw. II. No. 55. Ibid. p. 105. Inq. p.m. Roger fil. John, 33 Hen. III. No. 66. Arch. Ael. 4to series, ii. p. 98. 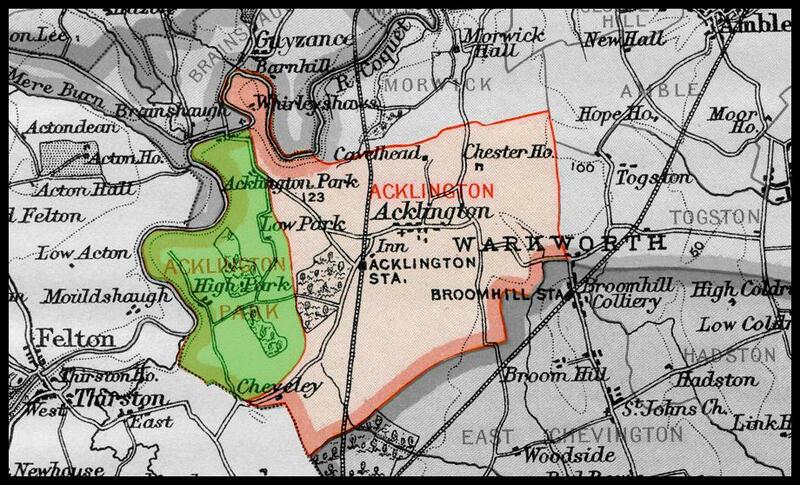 Owing to the windings of the boundaries, Acklington park is now more than five miles in circumference. The Census Returns are : 1801, 108 ; 1811, 125 ; 1821, 125 ; 1831, 107 ; 1841, 133 ; 18;1, 104 ; 1861, 163 ; 1871, 120 ; 1881, 142 ; 1891, 76. Cf. Kemble, Saxons in England, i. pp. 431-2. Atkinson, Forty Years in a Moorland Parish. London Gazette, 30th September, 1859. 1666, 23rd January : Inventory of Edward Muschamp of Acklington : Jane, his widow, gives up her right of administration to Robert Muschamp for her own use. 1682, 1st June : Inventory of Robert Muschamp of Acklington : Administration granted to Stephen and Isabel Muschons, joint administrators. , 1713, 17th February : Will of Isabel Muschamp of Akelington, spinster (sic), to be buried in the church of Warkworth. To my grandsons William and Robert James, to my grand-daughter Mary James, my daughter Jane James. My grandson John James, my farm ; he executor. Proved, 1713. Raine, Test. Dunelm. 1743, 13th May. Indenture tripartite between Henry Grey of Howick, esq., (1) Joseph Burrell of Lyham, gent., sole executor of the will of John Palfrey of Lyham, gent., deceased (2) Thomas Clennel of Newcastle, esq. (3) A mortgage of lands in Acklington described Howy's-close and Lamb's-mead, held under a twenty-one years' lease, dated 2nd April, 1730, from Charles, duke of Somerset, to the said John Palfrey, at the annual rent of £3, which lands were formerly in the occupation of Joseph Palfrey, father of the said John ; which lease was, 29th September, 1733, assigned to Henry Grey as security inter alia for £1,000. The mortgage is now assigned by Grey to Clennel to secure £700 advanced by him to Burrell. Rev. John Hodgson's Collection. Warkworth Guard Book. Earl Percy, The Ancient Farms of Northumberland. Arch. Ael. xvii. p. 10. Cal. Border Papers, Bain, i. p. 20. 1586, 25th February. Will of Thomas Lawson of Aklinton, yeoman ; to be buried in the parish church of Warkworth. John Lawson, my son. Raine, Test. Dunelm. Each cottager held common of pasture. Clarkson's Survey, circa 1567 ; Duke of Northumberland's MSS. A small farmstead is still called Whirley-shaws. The season of the hart and buck was called grease time because that was the season when they were fat and fit for killing. Hallnock's Dictionary, s.v. grease. Hained = kept back from pasture. Heslop, Northumberland Words. Clarkson's Survey, 1567 ; Duke of Northumberland's MSS. Arch. Ael. 4to series, iv. p. 163. The following is a list of the grieves or bailiffs of Acklington from whose accounts the foregoing items have been abstracted : 1472, Robert James ; 1474, William Male ; 1480, William Male ; 1486, William Male ; 1487, William Male ; 1489, William Male and Thomas James ; 1503, Thomas Pereson ; 1506, Thomas Turnour ; 1509, Thomas Symson ; 1519, James Patterson ; 1523, John Robynson ; 1524, John Symson ; 1526, Thomas Symson ; 1532, Thomas Symson ; 1533, John Lawe ; 1534, Thomas Pereson ; 1537, John Harpere ; 1541, James Robynson ; 1562, John Robinson ; 1585, Thomas Anderson ; 1587, Thomas Wright ; 1588, John Robinson ; 1589, William Robinson ; 1590, John Sympson ; 1591, Robert James ; 1592, Roger Wymprey ; 1593, John Jackson ; 1594, John Clay ; 1602, William Barker. Duke of Northumberland's MSS. Cartington's Rental, 14 Hen. VII. Duke of Northumberland's MSS. Inq. p.m. Henry Percy 26 Edw. III. 52 a. Arch. Ael. 4to series, iii. p. 1.38. An inroad of the Scots under Robert the Bruce was made about Midsummer, 1316. ' These desolations of war increased the scarcity and dearth which had arisen from a succession of destructive seasons, so that a quarter of wheat was sold in the North of England for forty shillings ; and the Northumbrians were driven to the necessity of eating the flesh of dogs and horses and other unclean things.' In June, 1342, David, king of Scotland, at the head of a numerous army entered England by the eastern border, wasted and spoiled, far and wide, the counties of Northumberland and Durham. Ridpath, Border History, pp. 252, 332. Inq. p.m. Rob. fil Rogeri, 3 Edw. III. No. 55. Arch. Ael. 4to series, iii. p. 104. Northumberland Assize Rolls, 40 Hen. III. Page, p. 97. Surtees Soc. No. 88. A field on Cavil head farm is still known by the name of the Key-hill. The Census Returns are : 1801, 257; 1811, 249; 1821, 269; 1831, 285; 1841, 301; 1851, 284; 1861, 255; 1871, 258; 1881, 230; 1891, 235. No traces exist, nor have any objects been found (so far as is known), of the prehistoric inhabitants of Acklington, though a reminder of early occupation is suggested in the name of the homestead of Chester-house, from which a road probably led, and has in part been traced, to Gloster-hill, near the estuary of the river Coquet. The feudal history of the township has always been included in that of the castle and barony of Warkworth, of which barony it is a member. There are a few notices of the vill and tenants of the thirteenth and beginning of the fourteenth century, and from that period onward the elaborate surveys, bailiffs' accounts and receivers' accounts remaining in the muniment room of the duke of Northumberland yield abundant evidence of the relationship of the tenants with their lord and with one another. A full account of Acklington in the year 1248 is preserved in the inquisition taken after the death of Roger fitz John, lord of Warkworth, N in which it was found that there were in Aclinton twenty-one bond tenants, each of whom held 30 acres of land, for which he rendered each year 3s. 6d. in rent, 4 quarters of malt barley (or 9s. at the lord's option); for stallage 2d. ; for the keep of the lord's draught horses and cattle (averiorum) 3d. ; and a fowl (or 1d.) to be paid at Christmas ; every week he laboured for three days (unless a feast intervened), or in lieu he paid, at the lord's option, 5s. ; in autumn he reaped the lord's corn for five days with two men (on three of the days the lord providing the food, on the other days he provided it himself) ; the value of this service was 6½d. He was bound to carry to the castle of Warkworth a load of firewood from Acklington, or give 1d. in lieu of the same. The value of the rents and services of the twenty-one tenants was £19 11s. 3½d. a year. The tenants held a meadow called Rumedu, for which they paid 5s. a year. Robert Annig held 3 acres of land, and rendered for the same a quarter of malt barley of the old measure ; and Roger Wansbe, by charter, held for the term of his life 20 acres of demesne land for keeping the park, and also 4 acres for which he gave 2s. 6d. a year for all services. There were also ten farmers who held 168 acres of land, and rendered 75s. 11d. a year, and each made forty works with a man a day (the lord providing food on four of the days), which, besides food, were worth 25s. a year. There were also two cottars, who held 5 acres and rendered 2s. 9d. for rent and made works of the value of 5s. William, the smith, for making the iron of Warkworth and shoeing the horses, held 9 acres of land. At the Northumberland assizes of 1256, Roger, son of Thomas of Esingwaud, pleaded guilty to the charge of stealing clothes (pannos) from the house of Robert, the son of Henry, in the vill of Aklinton. Evidence was given that he had fled to Bolam, and taken refuge in the church there ; he abjured the realm. N There were fourteen tenants assessed to the subsidy of 1296. Summa hujus villae, £12 10s. 5d. Unde domino regi, 22s. 9¼ d.
In 1309 there were in Aclington forty-seven bond tenants, each of whom held a messuage and 18 acres of land, and paid 9s. ; the total, £21 3s. There was a dovecote worth 3s., and a windmill worth £5 6s. 8d. N Three years later, fourteen tenants were assessed at £17 9s. 10d. for a subsidy. Totius villae de Akelinton, £17 9s. 10d. Unde regi, 35s. 1d. Thomas filius Roberti, 6s. 8d. ; Hugo Wayt, 2s. ; Hugo filius Rogeri, 2s. 8d. ; Ricardus filius Rogeri, 4s. 4d. ; Adam Stodhird, 4s. 2d. ; Robertus filius Willelmi, 1s. ; Rogerus filius Ranulphi, 4s. 3d. ; Willelmus filius Ranulphi, 3s. In a survey made about the year 1498 N it was ascertained that though there were at that time nominally thirty-five husbandlands or tenements in Acklington there were actually but eighteen, for seventeen tenants held two husbandlands apiece and paid 20s. a year ; and the other tenant, Thomas Pereson, who only held one husbandland, paid 10s. a year. The names of the seventeen tenants were : Robert and Thomas Jamys, William Gibson, Thomas Sympson, William Jamys, John Symson, John Pereson, John Hudson, William Patanson, Richard Wryght, Robert Jamys, Robert Hudson, James Katerall, William Maile, William Crawcester, Hugh Jamys, Robert Symson, Robert Wright. Besides the holders of the thirty-five husbandlands, there were eight cottage-tenants or cottars, who held directly from the lord, at rents varying from 1s. to 8s. 9d. a year. There was a system of suretyship common to both classes of tenants ; the tenants paid twenty-four rent hens ; and the sum of the rents was £19 13s. 11d. a year. The following extracts relating to Acklington are derived from the sixteenth-century bailiffs N and receivers' accounts preserved among the duke of Northumberland's MSS. 1526, Michaelmas. The bailiffs' account for arrears of last year, 61i. 8s. 8½d. ; rents and farms as in previous years payable at Martinmas and Whitsuntide, 19li. 13s. 11d. ; new rent as in previous years as appears by the rental, 4s. 4d. ; new rent of John Symson for farm of a brewery in the lordship leased to him by the lord's commissioners 13 Henry VIII. for twenty years, 2s. ; increase of farm of one small close called Kay-hill close, charged above at 16d. yearly, and leased by the lord's commissioners 9 Henry VIII. to Thomas Symson for 6s. 8d. yearly, 5s. 4d. Sum of receipts and arrears, 261i. 14s. 3½d. Allowances. William Gybson received by him of the rents and farms of the lordship for two years ending at Michaelmas, 14 Henry VII., and kept by him in the name of an annuity granted to him by the executors of the last earl at 20s. yearly, above among arrears 40s. Edward Radclyffe, late constable of Warkworth castle, received by William Male, provost, 17 Henry VII., beyond his fee of 10 marks yearly 17s. 11d. William Male, grieve, 21 Henry VII., for his arrears, 50s. 9½d. Christopher Thrilkeld, esquire, received of the issues of the lordship, 22 Henry VII., and claimed in part payment of 10 marks for his fee as constable of Warkworth castle the same year for which he did not show the lord's warrant, 20s. 1532. Increase of farm of a small close called Kyhil-close, charged above at 16d. yearly, now leased to Thomas Symson at 6s. 8d. yearly, 5s. 4d. New rent of John Symson for farm of a brewery within the lordship leased to him by the lord's commissioners in 1521 for twenty-one years at 2s. yearly, 2s. Sum, 201i. 5s. 7d. Allowances, etc. Delivered to Master Ingram Percy in part payment of his annuity as in carriage of grain from Aklington to Alnwick as appears by a bill dated 12th April, A° 24, 4s. 10d. 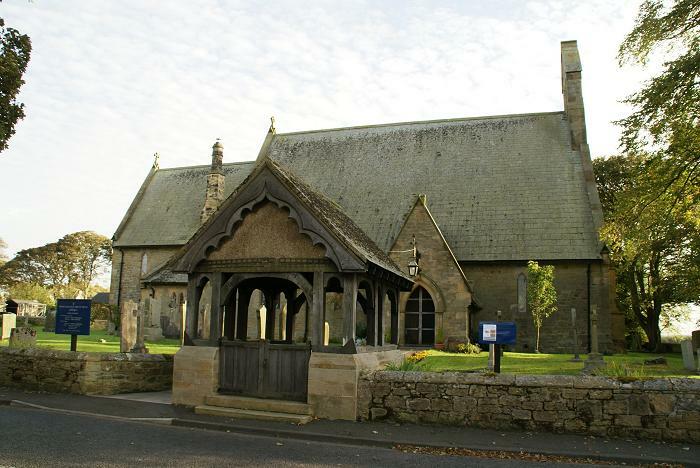 Paid to tenants of Aklington for carriage of 17 waggon loads of grain, corn, oats, and big, cart loads `in sheffes,' from Hedelston to the chapel of St. Mary Magdalene in Warkworth before Christmas A° 24, at 8d., as appears by a bill written by John Williamson, clerk, controller of the household,11s. 4d. 1534. Paid to tenants of Aklington for carriage of 36 bolls of coal from Ambell-hugh to Belton-feld (3s. ), and of 55 bolls of lime from Baton to Warkworth castle, at a 1d. a boll (4s. 7d. ), 7s. 7d. In 1538 the township sent to the muster but one man fully equipped, the remaining twenty-four, though able men, were wanting in horse and harness. Willme Pawttinson, horse and harnes ; John Robynson, Ryc. Borden, John Wryght, Thomas Symson, Rog. Symson, Willme Symson, John Thomeys, Robt. Symson, John Person, Willme Clay, Robt. Hudson, Willme Wryght, John Robyson, John Mantell, Ryc. Herryson, John Robynson, Robt. Symson, John Lawe, Thomas Smyth, James Pattonson, John Burstred, John Harper, Thomas Wryght, George Steynson, able men wanting horse and harnes. Eight of the able men present at the muster were living when the survey of 1567 was made, and at least eight others were represented by their sons or kinsmen of the same name. This document gives not only the estimated acreage of the arable, meadow, and pasture land belonging to each of the eighteen tenants, but the extent of the close or croft attached to his tenement, and the fine payable on admission or paid at the customary periods. A. R. Acres s. d. £ s. d.
Cottages Acreage of Cottages and Close, etc. Rent. Fine. A. R. s. d. s. d.
Ther ys neather avowson nor patronage of benefice in this towne of Ackelingeton, for yt ys parcell of the vicarage of Warkeworthe ; neather ys ther anie demeane lands or demaine meadowes, but all is occupied together in husbandrie ; yer ys no comone grounde to be improved, althoughe ther ys large comon, because of the barrenness therof, withoute greate hurte to the tenants, which of necessatie muste be cherished and rather helpt for service cause. Yt is mooche convenient yt all yt parte of ye comone which is betwixte ye easte corner of ye southeaste ende of Ackelington parke to ye gate of ye said parke, and as ye heighe streate called Warkworthe waye goethe wer inclosed with a stronge quicke hedge, and that the same so inclosed did lye twoo or thre yeares in haninge, N in which tyme ye tenants mighte with ther owne labor brynge ye same to a fyne grounde or at ye leaste to arable grounde wher nowe yt ys but rotten mosse grounde, which wolde be to the tenants in grease tyme N muche comodetie. as also to ye said parke a greate strengthe and saife garde to his lordship's game. And yt ys to be noted yt ye grounde called Whorle Charre, N which lyethe at ye northe caste corner of the said parke, enclosed on ye one syde with ye pale of the parke envyrouned on two partes with the water Cokett, ys the beste and moste comodiouse parte of all the comone. The same is alwaies eaten with ye cattell of Braineshaughe, Guisnes, and Bernehill, and muche suffrid by licence by the said tenants, - for that yt ys farre from them yt wer good the same wer also enclosed, but that ther ys a comon waye over at the forde of Braineshaughe which cannot he barred, or yf not, a lodge ther to be budded for the comone servaunte dewringe ye tyme of summer, or else a specyall respecte to be gevine unto the same or else ye same grounde wyll doe ye saide tenants not muche profett and in tyme be a specyall cause, the same to be improved to his lordship, which God forbyd yt sholde be so, for they maye not spare yt for nothinge. It wer also good that ye parcell of grounde called Cheaveley wer also enclosyd by the said tenants with a stronge quicke-hedge and kepte severall to the use of the said tenants, onelie provyded that the cottages had set foorthe to them suche parcell of ye said comone as wolde serve them or extende to suche quantetie of ye grounde so inclosed by the said tenants, which they owe to have as apperteaninge to ye cottagers, and yt they mighte lykewyse inclose ye same yt wer to them all a greate comodetie as also a ,greate strengthe to his lordship's game. Acres s. d. £ s.
* Also held a cottage with garden. †Also a cottage with garden, and toft with garden. At a muster of the Middle Marches taken by Sir John Forster at the Moot-law on the 26th of March, 1580, Acklington town was represented by only one able horseman ; N but at a muster of light horsemen at Abberwickedge on the 24th of November, 1595, there were present eleven footmen. Jo. Robinson, William Robinson, Jo. Anderson, Robert James, Jo. Clay, Jo. Lawson, and Thomas Robinson, armed with spears and defensive armour. Jo. Righ, furnished with petronel. Tho. Anderson, Rob. Robinson, and Tho. Wright, furnished with spears. As has been already observed, the rental of 1498 assumes the existence of thirty-five husbandlands in the township, though there were but eighteen tenants. This statement is the only record that has survived of an earlier stage in which, probably for military purposes, a larger number of holdings had been created than the land was able to maintain : a condition which had been reformed by the lord here, as at High Buston, by reducing the number of holdings by one-half, with the result that each tenant, save one, possessed two holdings. The surveys of 1567 and 1585 show the same number of seventeen (practically) co-equal tenements and one of half the extent and value. But all the surveys already quoted yield in interest to that of 1616, so rich is it in minuteness ; each plot, each strip and balk in every field is measured and shown, whether in meadow, pasture, or arable land ; so, also, is the area of each tenant's house and garth. A. R. P. A. R P. A. R. P. A. R. P. A. R. P.
A. R. P. A. R. P. A. R. P. A. R. P. A. R. P.
This towne of Acklington consisteth in seventeen farmes and a halfe, besides severall coatlands, . . . there farmes are lately divided ; they have a coale myne in their grounds, but noe lymestone but what they fetch five myles off; there houses are all in good repaire, and there tenements are worth about £25 per annum, being improved . . . the south parte of this towne is better by 20s. per annum then the north syde. `Idem tenantes inter omnes' hold a parcell of ground called Sheaveley, nuper Mr. Whitehead, at 2li. per annum ; but, being part of the tenements aforesaid, which they could not want, it was restored. ` The nine farms on the south syde' have the Coal-close and the west of the Coatlands, which are intermixed, 1,059 acres 3 roods 301 perches ; which doth reach to each farme 114 acres 0 roods 3 perches. 1700, 5th April. Inventory of the goods, movable and immovable, of Margaret Clay of Acklington. Imprimis : 4 oxen, £10 ; 6 kine, £16 ; 3 bull'd quies, £7 ; 3 unbull'd quies, £4 ; 2 stears, £3 ; 2 year-olds, £1 10s. ; 1 year-old, 15s. ; 2 mares, £5 ; 2 swine, £1 8s. ; 20 ews and 15 lambs, £7 6s. ; 6 sheep hogs, £1 4s. ; all ye implyments of husbandry, valued to £3 (viz., 1 pair of wheels, 1 long wayn, 1 short wayn, 4 yokes, 1 soame, a pair of horse gear, 1 horse harrow, 1 ox harrow, plow and irons, 2 bolts and shekles) ; bigg unsold, valued to £3 6s. 8d. ; pees unsold, valued to 16s. ; wheat sown valued to £5 8s. ; rie sown, valued to £1 ; oats sown, valued to £7 ; pees sown, valued to £1 ; bigg sown, valued to £4 ; 10 bonds from Ed. Hutton, at £3 15s. per bond, £37 10s. ; William Lee, indebted £3 18s. 6d. ; George Hair, indebted £2 2s. 5d. ; Roger Gray, indebted £1 ; Thomas Applebee, indebted 17s. ; Mrs. Watson of Morpeth, indebted £3 1s. 4d. ; household stuff, apprised to £15* Totall, £146 2s. 11d. *: 2 Household plenishings : 2 cupboards, 2 tables, 3 chores, 3 joynt stooles, 4 bedsteads, 5 chests, 2 feather beds, 2 other beds, 3 suits of curtains, 2 rugs, 2 coverletts, 5 blanketts, 4 pair of linen sheats, 7 pair of course sheats, 1 odd, 4 long bolsters, 6 short bolsters (all these stuft with feathers), 7 happens, 1 diper table cloth, a duzen of diper napkins, 1 plain table cloth, 6 course napkins, 1 dozen of huggaback napkins, 9 pewter dishes, 6 pewter plates, 6 pewter porringers, 3 pewter candlesticks, 2 pewter tankets, pewter flaggon, 2 pewter cupps, 1 pewter quart, 1 pewter chamber pott, 2 pewter salts, one duzen and ½ spoons, 4 cheany dishes, 6 cheany plates, 3 cheany porringers, a dropping pan, a bason, 1 pair of beaf forks, 1 pair of winters, 1 pair of toasting irons, 1½ dozen of trenchers, 2 kettles, 2 iron potts. 1 yettling, 2 panns, 1 frying pan, 6 milck bowlls, 3 milck tubs, 1 cheese tub, 4 pitchers, 6 cheese fatts, 2 chirns, 2 washing tubs, 6 other tubs, 4 stands, 1 pair of silk timses, 2 pair of hair timses, a pair of linn window curtains, a woollen wheel, a pair of woollen cards, a lint wheel, a pair of tow cards, 1 small heckle, 5 wallets, a winnowing cloth, a hedging spade, 1 ax, 2 bows, 1 lymestone hamer, 3 pitch forks, 3 pair of wayn blades unmade, 4 pair of new stings, 5 axle trees, 3 dormins, 4 couple of ciles, 2 plow beams, 2 square plow beams, 2 pieces of oak, 4 square sticks two yards long, 12 fellyes, 2 sticks for-four wain heads, 1 wayn unmade out, 13 pieces of oak and ash, 4 wain busks, 1 bee hyve, I muck how ; 20 futher of lymestones, to be left for the use of the heiress. Rev. John Hodgson's Collection. During the seventeenth century the old system of holding land by copy of court roll was discontinued, and was replaced by the system of leases for a term of years. Under the former, the tenant paid an inelastic and generally inconsiderable yearly rent, and on admittance, change of tenancy, and at customary periods, a not inconsiderable fine ; the onus of repairs and improvements falling upon him. The newer or reformed system retained for a time the practice of paying a fine or valuable consideration for the granting of the lease with a low yearly rent, but permitted the re-adjustment of boundaries and the re-grouping of holdings, whilst the burden of the cost of buildings, etc., was shifted from the tenant to the landlord. APPLEBY OF ACKLINGTON, STURTON GRANGE, EASTFIELD, AND LOW BUSTON. (a) Warkworth Register. (e) Enrolment of Leases, Duke of Northumberland's MSS. (b) M.I., Warkworth. (f) Eastfield Deeds. (c) Newcastle Courant, 2nd July, 1803. (g) Low Buston Deeds. (d) Felton Register. (h) Shilbottle Register. 1647, 2nd June. William Brown and Mary Appleby of Warkworth parish married. Woodhorn Register. William Harper, 4 farms ; Henry Grey, 3 farms ; Thomas Appleby, 2 farms ; John Womphry, 1½ farms ; Mrs. Grumble, 1 farm ; John Henderson, 1 farm ; George Robinson, 1 farm ; Thomas Anderson, 1 farm ; Henry Horsley, 1 farm ; John Appleby, 1 farm ; Field-house, 1 farm ; Coatlands, ½ farm. Total number of farms in Acklington, 18. At a later time these ancient holdings became grouped into the farms called or known as Chester-house, Cavil-head, Whirleshaws, Field-house, the Town-farm, Coal-houses, and Chievely. The townships of Acklington and Acklington park were, by an Order in Council, severed from the parish of Warkworth in 1859, N and, together with the extra-parochial chapelry of Brainshaugh or Guyzance, were constituted an ecclesiastical parish or district, the advowson of which church or the presentation of its minister or perpetual curate was vested in the duke of Northumberland, the sole owner of both of the townships and the owner of a considerable portion of the chapelry. A chapel dedicated to St. John, now the parish church of the new district, was built in 1861 from designs by Mr. James Deason. The benefice is endowed with a parsonage house and with the great tithes of the township of Acklington, parcel of the rectory of Warkworth. 1860. Henry E. Miles, M.A., of Magdalen college, Cambridge, previously incumbent of Rock and Rennington, and subsequently rector of Huntley, Gloucester. 1866. George Selby Thompson, M.A. (son of Charles Thompson, sometime curate of Howick), died 29th July, 1886, aged 77 ; buried at Howick. 1886. William Rudge, ordered deacon and licensed to curacy of Higham Ferrers, 1874. Incumbent of Lucker, 1883-1886. At the end of the fifteenth century there is mentioned a close 'juxta Aclyngton park' called 'heremyt fall,' N for which, about the year 1499, James Katerall paid a rent of 6s. 8d. a year, his sureties being John Brockett and Robert Crawcester of Guysyns. N Caterall was the ' parker ' or park keeper, and as such was paid a wage or fee of 60s. 8d. Ackington (sic) parke demysed to one Harbottell in the kynge's tyme, when the landes were in hys majestye's handes, and th'old rentt then was per annum vli. vis. viiid., which ys th'old rentt ; and now being in the lord's handes hytt hathe be adjoysted unto, and all that wold ryse that waye for the lord's profytt was not above ixli. yerly, as th'audyttores' bookes do showe : The keeper's fees per annum, iiili, viiid. ; the pallester's fees per annum, xxs. ; the charges of all the new paaling, 0. So you may see the great cleare gaynes yerly that cloth comeeth (sic) in, and yett I wold have you to desyre hyt of th'old rentt without eny fyne yf hyt wylbe hadd, which me thynkes shuld not styke at the thyng being not muche. Yf hytt wyll not be hadd, offer a fyne as muche, or as lytle, as you wyll, so as hyt exceed nott above C markes. But me thynkes yf he wyll needes have a fyne he shuld not aske of you above 30 or 40li. But the better cheap you gett hyt the better shalbe for your sellfe. Gyve no more rentt for this park of Aklyngton but th'old rentt in eny wyse, for else small pleasure ys hytt by haveyng therof. In the bailiffs' account of 1602 there is entered the account of Johr Rushforth, farmer of Acklington park, the herbage of which he seems to have held under the lease granted to Roger Thorpe for the term of his life. N As a tenant from Ogle, Lawrence Rushforth appeared at the muster taken on Clifton field on the 24th of November, 1595, duly furnished and mounted on a black horse with a white star. N In 1616 he held one of the eighteen customary holdings or farms in Acklington. In 1629 Laurence Rushforth of Acklington park was confined in Morpeth gaol for a debt of £100 and £10 costs at the suit of Marmaduke Macholl. N His chief claim to be noticed is through his son, John Rushforth, or Rushworth, the indefatigable collector and antiquary, sometime recorder and M.P. for Berwick, who is stated to have been born at Acklington park about the year 1608. N As one of the clerks of the House of Commons, John Rushworth was present at that stirring scene in the Long Parliament when King Charles I. came down to arrest the five members, and he it was who took down the speech made on that occasion. RUSHWORTH (OR RUSHFORTH) OF ACKLINGTON PARK. (a) Ex inf. Mr. G. McN. Rushforth of Oriel college, Oxon., who has furnished many of the proofs of the pedigree. Cf. also Hunter, Familiae Minorum Gentium, Harl. Soc. p. 420, Dictionary of Nat. Biography, etc. (b) Cf. Yorkshire Arms and Descents, Harl. MS, No. 4198. (c) Dodsworth MSS. vol. 45, f. 112 b. (d) Dugdale's Visitation of Westmorland, also Pedigrees of Yorkshire Families; Brit. Museum, Add. MSS. No. 32116, f. 32. (f) Scott, Hist. of Berwick, p. 475. (g) Surtees, Durham, ii. pp. 146, 150. (h) Marriage Licences, Harl. Soc. vol. 24, p. 77. (i) Ibid. vol. 23, p. 138. (k) Cf. Notes and Queries, 2nd series, xi. (1861), p. 263. (m) Duke of Portland's MSS. ; Hist. MSS. Com. 13th Report, app. pt. ii. p. 164. (n) Records of Lincoln's Inn (pub. 1896), i. p. 244. Reed disposed of the works in 1828 N to David Thompson, a Galashiels manufacturer, a neighbour and correspondent of Sir Walter Scott, and himself a versifier. In his family the manufactory remained, and was carried on till 1884, when it was finally discontinued. The bridge was built across the Coquet about 1865. St John's Church, built is 1861 to serve the newly formed parish of Acklington. Gallery of modern images of Acklington and Acklington Park townships. The iron works/ woollen mill main building. Now private residential property. The weir The weir, panorama. Also see: Guyzance tragedy.